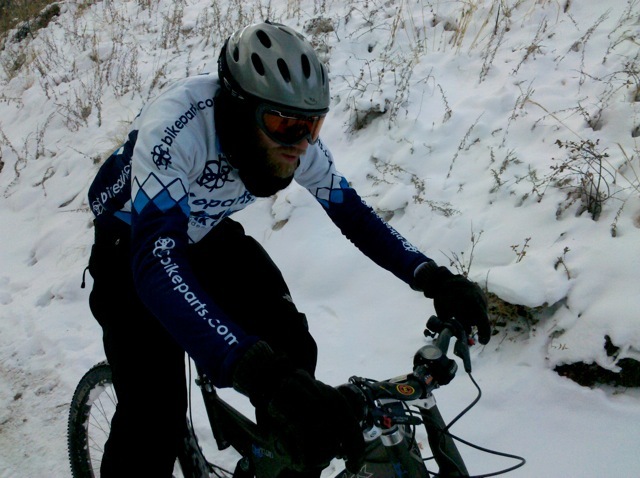 Cyclist ride in all weather conditions – from hot sun to cold and snowy conditions. Now that winter is officially here, staying warm on the bike is crucial. But how? What is the best way to layer clothing for winter riding? When you are riding, you want to balance your warmth and comfort with the intensity of your bike ride. If you are really bundled up when you start riding, you will likely want to start shedding layers. It may feel good to sweat in 25 degree weather, but you want clothes that are both breathable, wind-stopping, and sometimes waterproof. You also want to evaluate the type of ride you are doing? Is this a training ride? Will you be working really hard? Or are you just going to work? At Peak Cycles Bicycle Shop in Golden, Colorado, we’ve been asked all of these questions. Here is what we have found works, and works best! Head: You can wear a buff or a cap. Buffs are really good for neck protection as well. Another option are balaclavas – especially so if you want to keep almost your entire face warm. Eyewear: Sunglasses with yellow or orange lenses help to reduce the undulating motion of the snow surface. You can also get a solution to put on the lens to reduce moisture build up and prevent fogging. While not as stylish as some of the cycling eyewear we carry on BikeParts.com, you could consider wearing goggles to help protect our eyes and face in snowy conditions. First: A light, long-sleeved jersey that has pockets in the back is a good base layer and gives you the opportunity to put extra cloths in the back pockets. Second: Put another thermal layer on top of the long-sleeved jersey. You want something fairly light, warm, and breathable. Finally, third: You want to top your upper body layering with a wind-stopper jacket that deflects wind and preferably is also waterproof. Stop by Peak Cycles Bicycle shop and see which brand fits you best: Endura, Mavic, or Pearl Izumi. Hands: Cold hands makes it hard to maneuver the bike. Definitely go for long-figured gloves or liner gloves with thicker gloves. Fatbike riders may opt for porgies. Lower Body: In the winter you want to have something covering your entire legs. Fleece lined chamois are often a good choice. Many bikers also use cross country ski tights under their biking shorts. Peak Cycles Bicycle Shop has Endura and Mavoc pants, chamois, which will all be good down to about 10 degrees. There are also waterproof pants to keep the wet off your legs. This is important if you are riding in snowy conditions. Feet: Who likes cold toes? Nobody! It’s really important to keep the feet warm on winter rides. Road and mountain bike cyclist may opt for thick wool socks. Fatbike riders will want to go with insulated shoes with thick socks. If you can get waterproof shoes, that is even better. There are a number of options out there depending on if fatbike riders want to ride with flat pedals or clip less pedals. Riding your fat bike in the winter, you can ride with winter snow boots which will keep your feet warm. If you are riding with clipless pedals, Specialized and other companies make insulated biking boots. Regardless of what type of bicycle you are riding, polypropelene shoe covers are a must when keeping your feet warm because they deflect wind. You can also carry chemical toe warmers in case your feet get really cold. Seeing is believing. See for yourself how to layer for winter cycling. Check out our very own video – a great resource outlining when to add certain layers at certain temperatures. This entry was posted on Thursday, February 5th, 2015 at 6:00 AM and is filed under Peak Cycles Bicycle Shop, Videos. You can follow any responses to this entry through the RSS 2.0 feed. You can leave a response, or trackback from your own site.